Hardcover, 9 x 13 in. / 256 pgs / 120 color / 100 duotone. 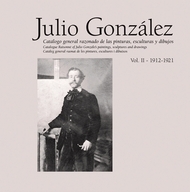 Julio Gonzalez, born in Barcelona in 1876, is among the true pioneers of modern sculpture. He has had an immense influence on the course of sculpture in the 20th-century due to his use of linearl surface elements and idea of surrounding space as a sculptural material, ideas that helped replace the idea of the closed body in which form is determined by the mass of the material. FORMAT: Hardcover, 9 x 13 in. / 256 pgs / 120 color / 100 duotone.